Champion Nutrition Wipe Out With Crave Control On Sale! If You Perfer Champion Nutrition Wipe Out (without crave control) Click Here! WipeOut™ delivers an innovative 4-Stage process of burning fat and re-charging your metabolism. The ingredients in WipeOut™ have been shown to transport fat out of fat cells and into muscle cells where it can be burned away! Its unique combination will raise your metabolism, ease your food cravings, and boost your energy to maximize fat burning and deliver real weight loss results. WipeOut™ Crave Control is the most complete weight loss product that not only reduces body fat, but also supports improved energy, mood, and mental focus caused by the stress and fatigue of dieting. 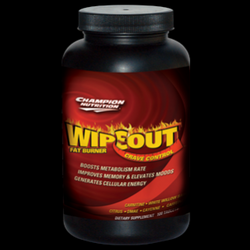 Start wiping out fat and cravings now with WipeOut™ 4-Stage Fat Burner with Crave Control!